With the 2018/2019 Brut Australian Baseball League season done and dusted, now it's time to look back at how each team fared in reverse finishing order. First up, we look at newcomers Geelong-Korea. Geelong-Korea's inaugural ABL season yielded only seven wins, as they struggled to find their feet in the South-West Division. Four series sweeps does not make for positive reading for GK fans, but there were plenty of memorable moments. Geelong-Korea recorded its first-ever doubleheader sweep on December 15 with narrow wins over fellow expansion team Auckland, while on January 4 Joo-Ho Lee nailed his first and only homer of the season in the top of the 10th to give GK an unassailable lead against the Bite. Their only affiliated player - Cubs farmhand Kwang-Min Kwon - blasted six homers and was a reliable glove in the outfield, while Jin-Yong Jang showed flashes of brilliance on the mound. Former KBO arm Jin-Woo Kim was flagged pre-season as a player to look out for, but the 35-year-old never got going, compiling a 1-8 record and a 9.36 ERA. Despite striking out a team-high 51, Kim allowed 43 earned runs in 41 1/3 innings of work. They have identified a number of players that can be successful at ABL level. In 33 games this year, Yong-Wook Lee and Seung-Won Shin both hit .291, while Byeong-Geun Kim made a successful transition from reliever to starter. In his first 23 innings as a starter, Kim allowed five earned runs and claimed two of his three wins. Kim only surrendered three walks in that span, and instantly became GK's most reliable starting pitcher. They were ranked fourth in the regular season for stolen bases (40), and struck out 42 less times than fellow expansion side Auckland. Geelong-Korea's depth was often tested, which resulted in a number of blowout losses. GK conceded 10 runs or more in 15 of their 40 regular season matchups, and conceded five walks per game on average. Couple those numbers with an unsettled starting rotation gave Manager Dae-Sung Koo some headaches. Their team ERA sat at 8.36 through 40 games, while their WHIP sat at 1.89. Consistency was an issue offensively, as four of their regulars (Dae-Gun Kook, Han-Gyeol Joh, Hwi-Yeon Park and Joo-Ho Lee) all hit below .200. Defeated Perth 13-10 at Perth Harley-Davidson Ballpark on January 13. Down by five in the eighth and coming off the back of an 18 run loss the night before, GK had no business winning their round nine finale against Perth. But three RBI apiece from Yong-Wook Lee and Jong-Hyuk Lim and some clutch relief pitching from Byeong-Geun Kim sealed a memorable extra-innings win on the road. 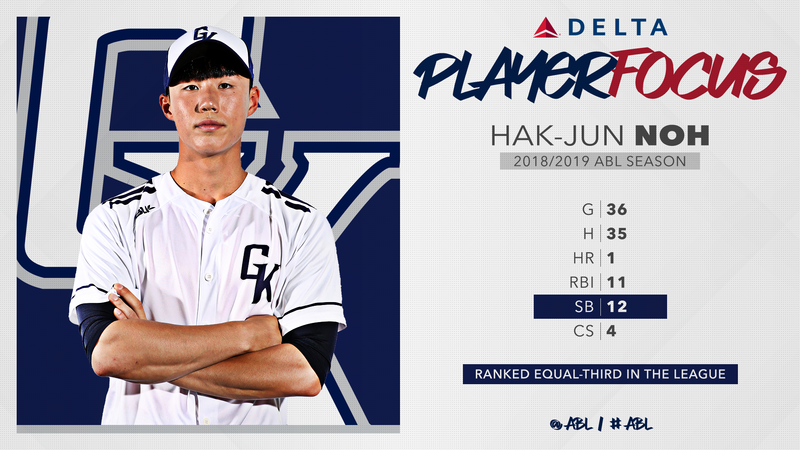 The 19-year-old outfielder put together an impressive ABL campaign, recording team highs in hits (35), doubles (9) and stolen bases (12, t-3rd in the league). GK were had a tough final fortnight facing Brisbane and Perth, but Noh's production continued, claiming a hit in eight of his team's last nine games. You can't go past Geelong-Korea's first win. GK out-hit South-West Division winners Perth 10-5, and rode a solid start from Jin-Yong Jang to pick up win number one. Jang allowed one run in six stellar innings, while offensively Kwang-Min Kwon and Sung-Gu Han both nailed their first homers of the season. There were some positives to come out of Geelong-Korea's inaugural season, but wins were few and far between. Dae-Sung Koo and his team will be hoping for successful sophomore campaigns from Noh and Kwon, two men which GK can build around. 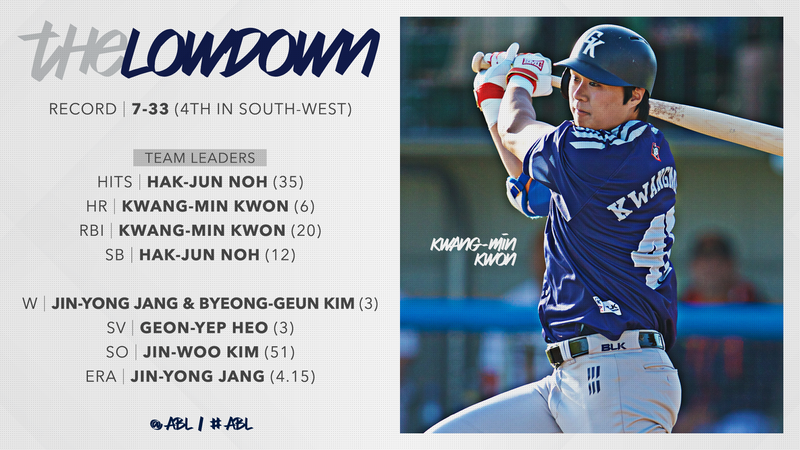 Jin-Yong Jang and Byeong-Geun Kim both have the ability to anchor GK's starting rotation, but as the old saying goes - pitching wins games, offence decides by how much - and Geelong-Korea's pitching will need to improve dramatically in their second season. What grade would you give Geelong-Korea?